Finalhazard in Sonic Adventure 2's Last Story. 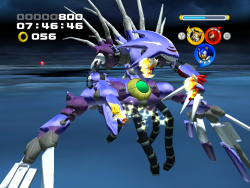 Metal Overlord in Sonic Heroes Last Story. In the Sonic games, a Last Story refers to the final section of the single-player story mode, typically appearing as a "secret" selection on the game options screen and only unlocked after fulfilling specific requirements: often the completion of all the game's normal character storylines, along with the collection of all 7 Chaos Emeralds. The Last Story typically brings the plot of the game to conclusion; cutscenes play, secrets are revealed, supers get transformed, and the player finds themselves pitted against the real final boss. The first Sonic game to explicitly include a Last Story was Sonic Adventure 2. Once both the Hero and Dark stories had been completed, a third option became accessible in the Story Select menu, labeled "Last". The Last Story saw mysteries revealed about Professor Gerald's final descent into madness, with both heroes and villains forced to team up for the massive final level, Cannon's Core, and the final bosses, Biolizard and Finalhazard. Although Adventure 2 was the first game to call it's final chapter "Last Story", Sonic Adventure 1 included a very similar conclusion under the auspices of the "?" Super Sonic character selection. Here Sonic made a final tour of Mystic Ruins, tracking the progress of the renegade Chaos just before his final transformation, and revealing the last details of Pachacamac's ancient crime against the chao. The final boss sees Perfect Chaos fight Super Sonic in the ruins of Station Square. One could go so far as to extrapolate the trend back further, to Sonic 3 & Knuckles. 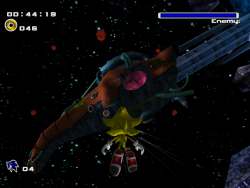 The Doomsday Zone fulfills many of the criteria of a Last Story: a final boss inaccessible in normal play, only unlocked after the Chaos Emeralds(or better the Super Emeralds) have been collected. However, since the level is continuous with Sonic's normal playthrough after Death Egg Zone (Sonic & Knuckles), Doomsday is not generally considered a Last Story. Likewise, Sonic Unleashed and the storybook titles do not have Last Stories, since their last bosses don't require extra accomplishments to unlock beyond clearing the Sonic-only story.